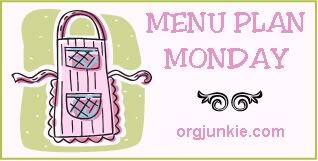 Join us for the Clever Chicks Blog Hop at The Chicken Chick. 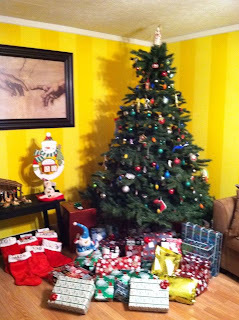 I have been getting a lot of questions about my striped walls in my Christmas pictures and I thought I would share how it was done. Luckily as we were doing them I took a lot of pictures because I am trying to document the remodeling of our house. My husband is on disability from injuries he sustained in a car wreck in 2008. Since that time our income has drastically changed. When he first had his wreck we had bought a lovely five bedroom home on ten acres with plenty of land and woods. Quess what? With a husband who doesn't always feel up to work it was too much for us. Luckily we were able to sell and moved into a rental house until we could find the "right" place for us. We stayed at the rental house for a year and nine months. In September we found the house that we are currently in. The house was a great price (as in we will have it paid off in SIX years - that's right six years) but needed some work. Nothing was wrong with the house structurally but it had been empty for three years. The hallway was an ugly olive green with textured paint, the carpets were stained, the back deck was gone off the house, but when we walked through it we knew we could fix everything that was wrong with it. 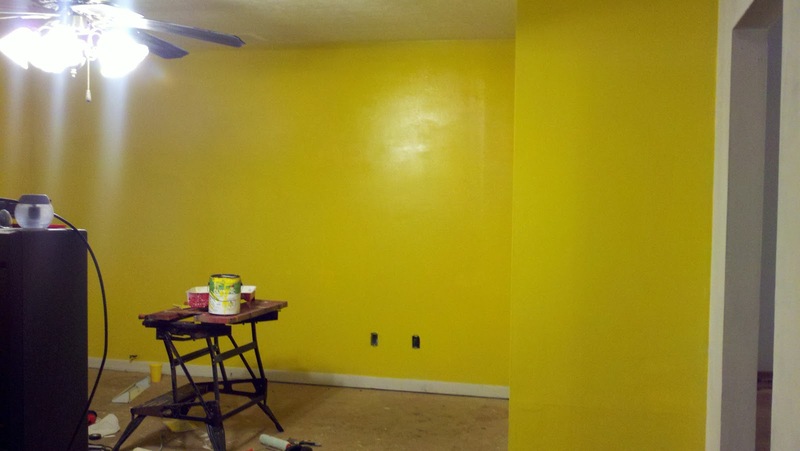 It is amazing what some paint will do to a room! It was suppose to be much lighter, and I was sick as soon as I started painting it. I was ready to scrap it all, and go get a new paint color. However, my husband and I started trying to come up with ways we could save it. 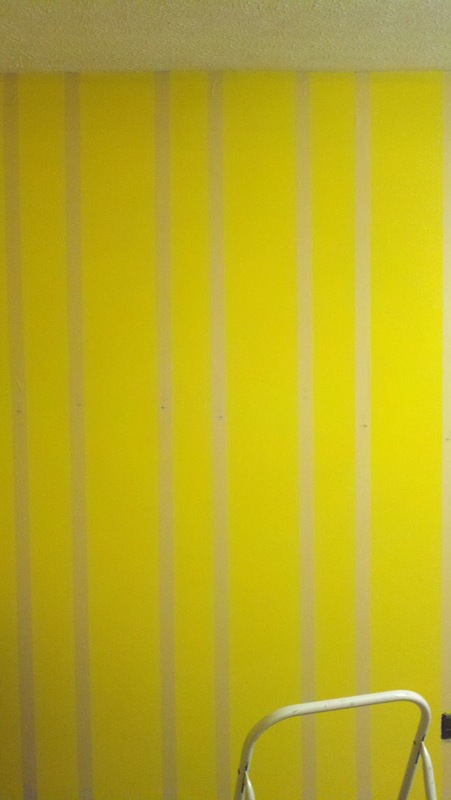 My daughters had been wanting wall stripes in their room, and I thought "You know, that just might work in here." And if it didn't work, no big deal because we are going to have to repaint anyways! 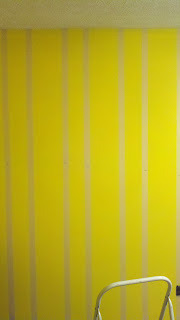 So I started researching how to paint stripes on walls. All of the tutorials I found suggested painting the entire room with a flat base coat before striping. Well, I had used semi-gloss instead of flat but I decided to do it anyhow. I went to Lowes and chose a lighter color yellow off of the same color swatch that the current yellow was from. I bought it in flat so that the two shades would have the different texture. 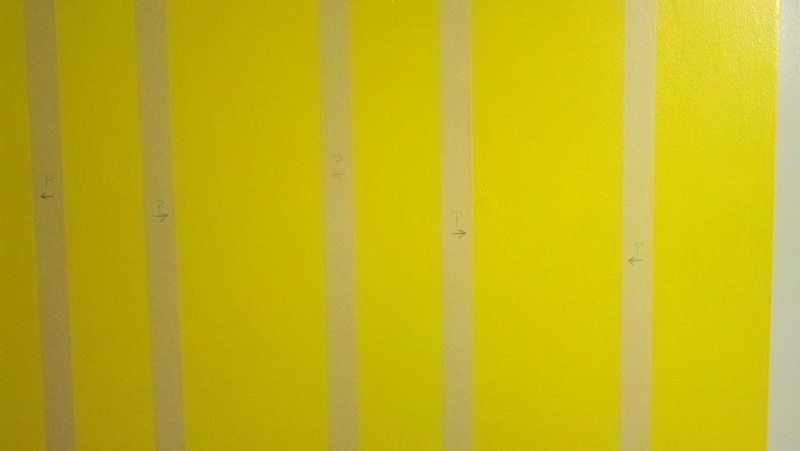 When I stripe the girls room I will paint the entire room in flat first, and then stripe with a semi-gloss but since I had the semi-gloss on the wall first this time I did it backwards. To make the striping easier I decided to make my stripes the same width as my paint roller. I believe it was nine inches. We started taping off the wall with masking tape to stripe the walls. Here is a secret...we had some of the expensive blue painters tape and some of the cheaper masking tape because we didn't have enough of the blue to do the whole room. The cheaper masking tape actually worked better! As I looked at the tape stripes I was overwhelmed, and worried that I would forget which tape lines I was suppose to paint between. So I decided to label them. 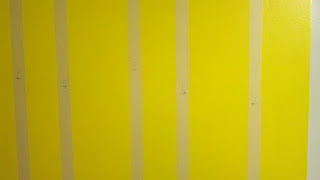 It is hard to tell in this photo but I took a pencil and marked the stripes I was to paint by putting a "P" and an arrow pointing to the side of the tape I was to paint on each piece of tape. It is important to take the tape off while the paint is still wet. 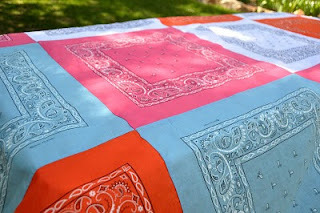 If you let it dry it will allow the paint to soak through the tape and run. It really didn't take too much time to paint the stripes. From the time we started putting up tape until the time we finished painting the stripes it was about three hours. 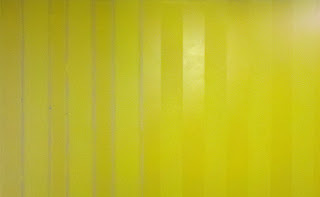 Our base coat on the wall had been drying for about a day when we applied the stripes. 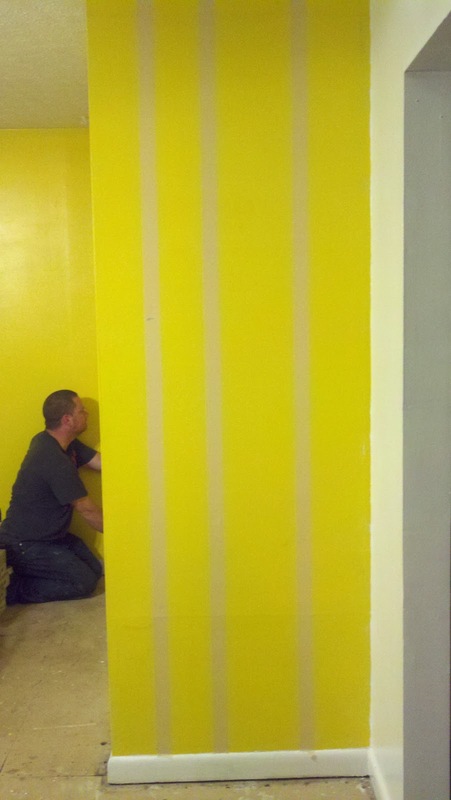 Please let me know if you have any additional questions about striping the walls. I highly encourage you to give it a try, it really is not as hard as it looks and gives the room a great look. Everyone who sees it loves it. did you use a plumb line or something to get the straight lines? I am so sorry I forgot to include that information! We used a laser level to make the lines straight. It was less than $25 to buy.